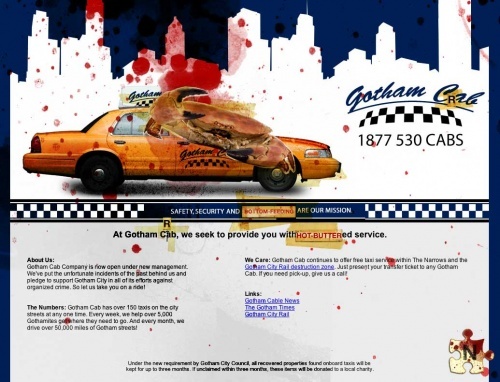 Gothamcab.com is a promotional page for the taxi service in Gotham. SAFETY, SECURITY AND EFFICENCY ARE OUR MISSION. 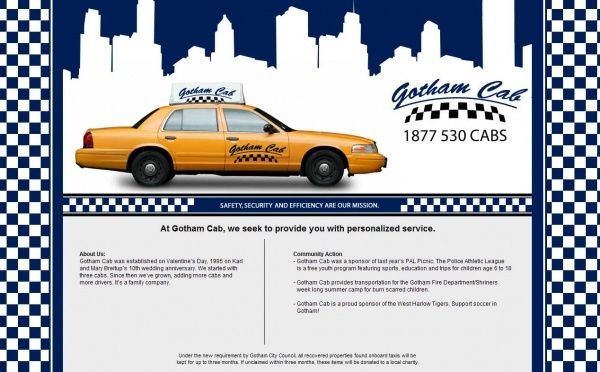 At Gotham Cab, we seek to provide you with personalized service. About Us: Gotham Cab was established on Valentine’s Day, 1995 on Karl and Mary Breitup’s 10th wedding anniversary. We started with three cabs. Since then we’ve grown, adding more cabs and more drivers. It’s a family company. Gotham Cab is now offering free taxi service within The Narrows and the Gotham City Rail destruction zone. Simply present your transfer ticket to any Gotham Cab. If you need pick-up, give us a call. - Gotham Cab provides transportation for the Gotham Fire Department/Shriners week long summer camp for burn scarred children. - Gotham Cab is a proud sponsor of the West Harlow Tigers. Support soccer in Gotham! Under the new requirement by Gotham City Council, all recovered properties found onboard taxis will be kept for up to three months. If unclaimed within three months, these items will be donated to a local charity. 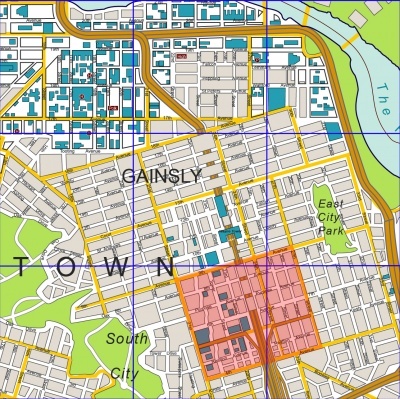 Clicking on "Gotham City Rail destruction zone" (a reference to Batman Begins) brings up a map showing the destroyed area in red. This map would later be used for Whysoserious.com/Theperfectgetaway. After the Whysoserious.com/Overture countdown had ended at 10PM EDT, Gothamcab.com was "Jokerized" along with nearly every other page in the game. Don't worry about all this stuff in the papers. Now I'm told Garcetti is handling it. Rossi called me this morning. He's got more work. Double the payment. Sounds good, right? If anyone comes to us with questions, we've just got to keep our mouths shut. Understand? Karl Breitup is one of the founding members of the Gotham Cab Company, which was established on his 10th wedding anniversary (February 14th, 1995 or 2/14/1995)..
Hey Breitup, Listen up, you and your partner should come by Betty's House of Pies, come on our regular time on Saturday. The waitress will have that special just for you...know what I mean? Hello. This is Gotham Cab. We...shut down and...no, we're not talking to the press. I can't thank all of you enough for the contributions to our trial fund. Goodbye and...God bless. Yeah, Mary. I'm gonna be filin' the motion that seizure of assets places undue burden on the family. But uh, as I told you at our meeting yesterday, I...don't expect much to come of it. But I promise, we won't give up. Call me anytime. A new message is left on the Gothamcab.com voicemail system. Yeah, hey Mary, this is Gotham Johnny. Look, eh, the guys passed the hat around again - you know, for you and the kids. The man was a stand-up guy. We're all tryin' to do right by him, 'kay? So call me and we'll set somethin' up, huh? A new message. Download the last two voicemails from Zshare here. Hey Mary, it's me. Okay, so - we're all set for 2pm at Rossi's. Uhh, look. Don't be so proud, okay? Eh...if ya don't want the money for yours own, take it for the kids. We honor our debts, ya know? Later that day, there was a violent hostage situation at Rossi's where Mary Breitup was inexplicably killed. A second victim, Jonny Marinotti (who may be "Gotham Johnny"), is reportedly in critical condition. On March 26, the new issue of The Gotham Times reports that Gotham Cabs is being shut down due to Karl Breitup's death, as well as the allegations that the company had mob-connections. Gotham Cab wants to thank our customers for your many years of business. It was a pleasure assisting you with your transportation needs. We are currently working with the city to restore our service to the streets of Gotham. Future updates will be posted to this website, or call us for current status. This page was last modified 18:16, 24 April 2012. This page has been accessed 50,491 times.